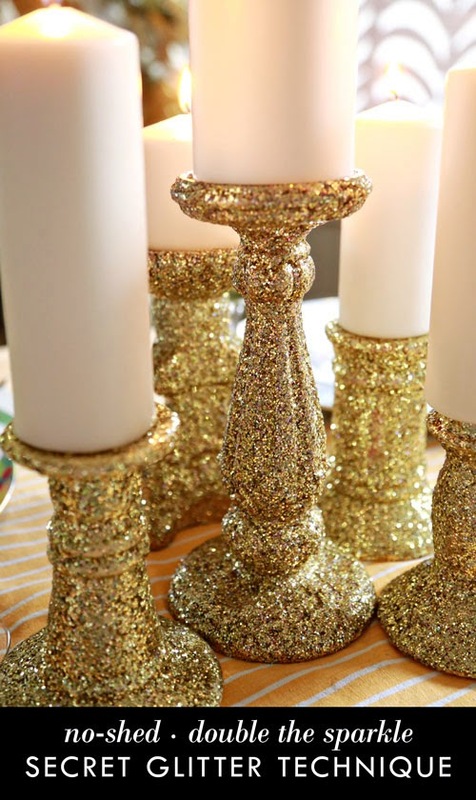 Glitter, sometimes referred to as "the herpes of craft supplies," gets a bad rap. A sparkly, spangled, bad rap. But if there was ever a time to flex your glitter muscles, it would be this time of year. Just as the holiday season is about to kick off. By using this technique, the initial glittering process is still messy (AND FUN) but the aftermath is much more tidy. You won't be finding glitter bits in your vacuum come St. Patrick's day. 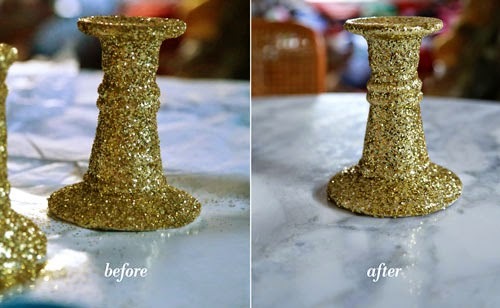 Also, this technique amps up your glitter to make it more sparkly then ever! 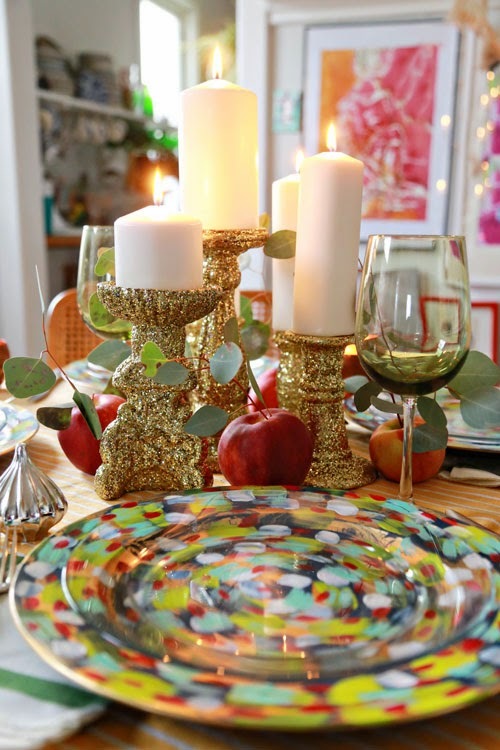 This cluster of thrift store candlesticks makes for a great centerpiece, but you can use this method on anything that will stand still; ornaments, knick-knacks, silk flowers...you name it. Want to see more? Let's get started! 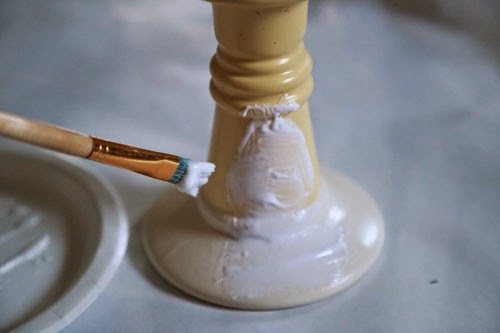 Use paint brush to apply a layer of tacky glue all over the surface of your candlestick. 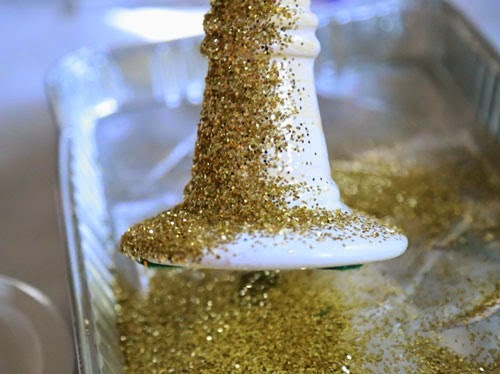 Toss liberally in large grain glitter, catching excess on a tray or paper that can funnel the extra glitter back in the bottle. After everything is covered, allow to dry overnight. 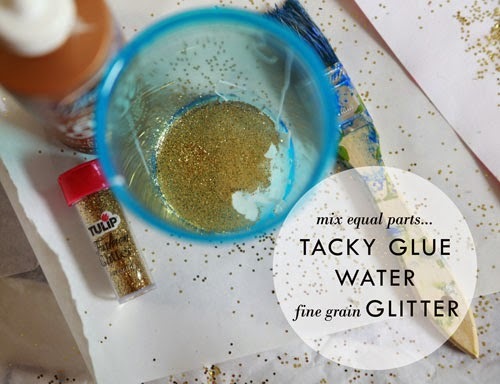 Secret solution:In a disposable cup, mix together equal parts fine grain glitter, tacky glue, and water. Blend thoroughly using your brush or a plastic fork. Note: For me, a tablespoon (or so) of each of these items will provide enough secret solution to cover three candlesticks. Don't worry about exact measurements - eyeballing it is fine. Also note: To keep things simple for demonstration purposes, I used two shades of gold glitter. In most other circumstances, at this step, I will mix together 2-4 different kinds of fine grain glitter, just to add richness and depth. You really won't see the different colors in the end, it's the contrast between the little reflective bits that creates the extra sparkle. The light bounces off each spec of glitter slightly different, and the end result is impressive! My favorite all-purpose glitter combo: gold, copper, pink, and opalescent -- it looks great on top of any color glitter (PS: Tulip sells variety packs). Apply the mixture all over the surface of the candle. After a few hours it will be good to go! 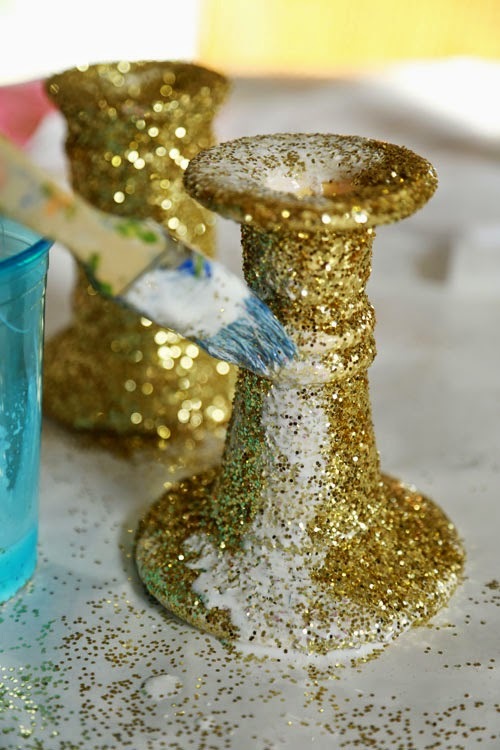 If you are working on an object that will be handled frequently (like a light switch or a piece of furniture) a second coat of the glitter solution is a good idea, but not required. The camera picks up on some of the difference, but you really need to see it in person. The after results reflect so much more light. The texture is amped up, and the detail of the under object comes through in a big way. 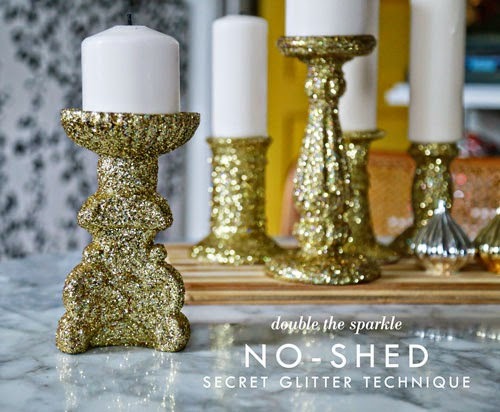 Best of all, you can move it around the house, and store it for years, and no glitter will come off. It's stuck. BAM. It's not going anywhere! thank you SOOOO much for sharing this technique...love that it enhances the sparkle AND makes it safe from spreading everywhere! I love this. I only started reading Aunt Peaches a month ago, but last night was about to take on my first glitter project and ran out of time. This is perfect... going to glitter up some retro butterfiles for my daughter's nursery and this will make sure they don't rain glitter down into her crib. I'm so excited (yes, like Jessie Spano but without the caffeine high). I love you!!!! Not only did I learn how to keep the glitter where it belongs...Aleens in an upside down bottle???? SCORE!! Yeow!! Love the definition it gives your base object. I am so excited about this project! I love glitter sparkle and shine! Thank you so much for sharing! I came upon your website while I was searching for a way to create an all-glitter aisle runner for my wedding. Do you think this technique could be used for that purpose? Also, do you have a recommendation for a color combination to use for a silver glitter aisle runner? Thanks in advance! Hello. I was wondering if the same thing can be done with modpodge. I normally use modpodge when I use glitter. Genius !!! ( : Happy Holidays ! 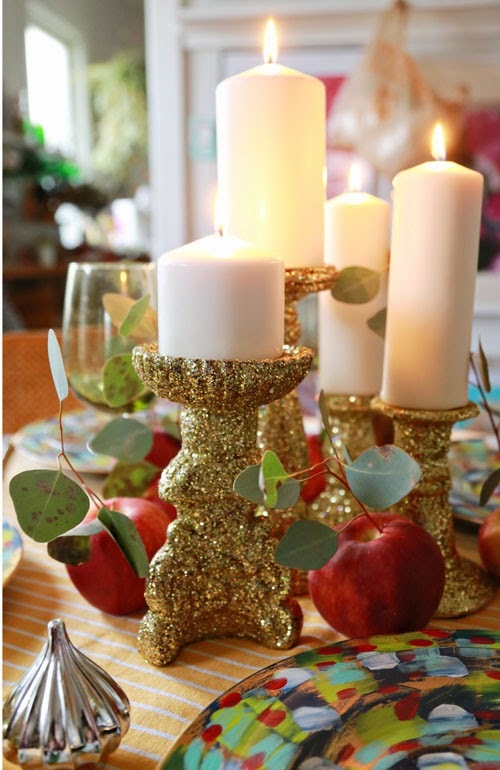 These candle holders are super cute. What a great way to turn something ordinary into something cute with glitter! What if I only have modpodge? Hello I'm going to try this technique look easy. .. This is Jessica from Woman’s Day and Country Living. 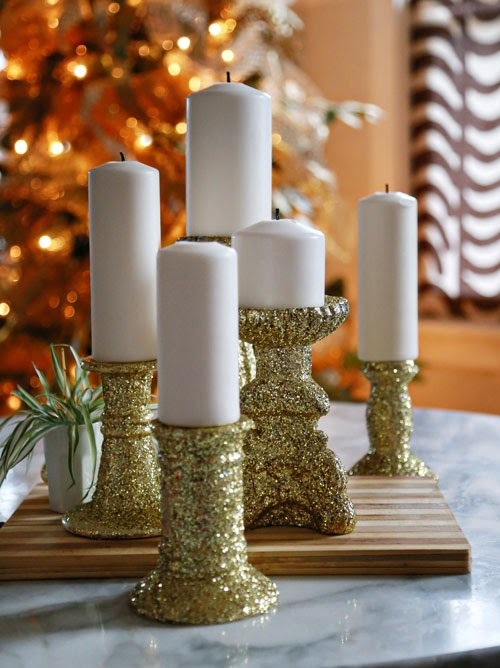 We just wanted to let you know that we also featured your craft, DIY Glitter Candlesticks, in our gallery titled 11 Fun, Easy Christmas Decorations That Start at the Dollar Store. We credited your blog and linked to your site. Since other Hearst sites like GoodHousekeeping.com, RedbookMag.com, and Cosmopolitan.com can syndicate our content, your craft has the potential on going on other sites as well, which means more traffic and exposure for your blog. For those wondering, Yes, Mod Podge works just as well. I barely add any water as I like it thicker but it works great! will this work on glitter paper, I bought paper with gltter already on it? 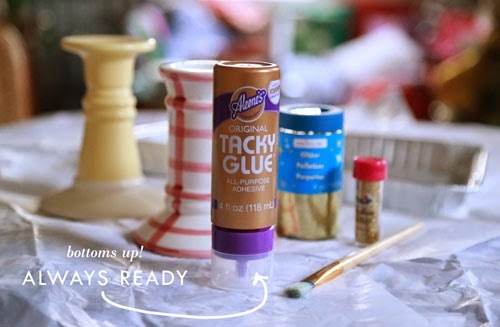 So are you recommending using tacky glue vs modge podge? I usually use modge podge but the sparkle dulls after sealing it. I would delete all the spam in the comments from your website.I would contact your webmaster. في شركتنا نعمل بأقل الأسعار، كما تعمل الشركة على استخدام أفضل واقوي وأحدث الاساليب التي تستطيع أن تميزها عن باقي الشركات التي تعمل في هذا المجال، وتمتلك شركتنا الخبرة الكافية في هذا المجال لان شركتنا تعمل في هذا المجال منذ فترة كبيره جدا. تمتلك الشركة فريق عمل مميز ومدرب علي اعلي مستوى من الخبرة والكفاءة والتميز الذي لا يوجد في اي شركة أخرى؛ فشركتنا مميزة ومبدعة ورائدة في عملها وتمتلك اسعار مميزة جدا، فأسعار الشرك مناسبة جدا.